Our goal is to produce a 10 exhibits annually in the Bridgeport gallery space and in the greater community celebrating the rich culture of the region. 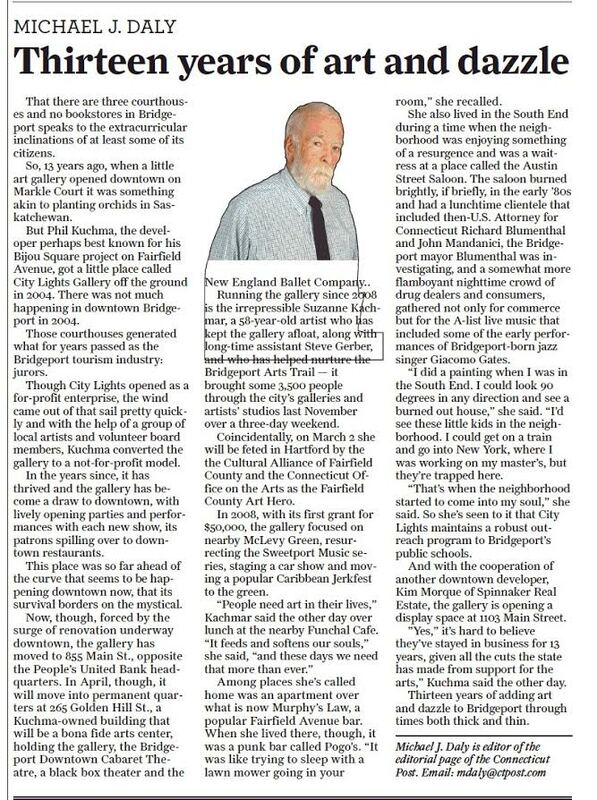 Voted “Best Gallery in Fairfield County” (6 times in the last 7 years.) by the readers poll of the Fairfield Weekly. Admission to our gallery space is free and open to the public. We have an open door policy, enabling individuals and organizations to use our facility for community meetings and cultural events. In the past 8 years C/L attracted over 42,000 attendees to events that we hosted or presented through partnerships with others. Attendees viewed art, enjoyed music, dance, spoken word and film in the gallery space and throughout the city. City Lights averages an annual distribution of $45,000 to regional artists through, commissions, stipends and art sales from C/L exhibits and community programs and networking. C/L continues to provide cultural enrichment opportunities for youth through art and chess programs at Bridgeport schools and libraries, facilitating programs for 2200 students in 8 years.